There is a world championship competition for Cluedo every few years. 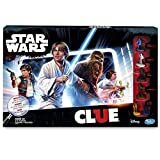 Standard Clue(do) provides 324 possible outcomes, the Gift and 50th anniversary editions boost it up to 378 with the addition of a 7th weapon. In an episode of Northern Exposure, the leads play a surreal game of Clue in which the man imagines the girl to be Miss Scarlet. The 1963 Clue can be briefly seen in the current film Toy Story 2. 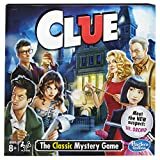 The United Kingdom, Australia, Germany, Portugal, and Sweden all had a version of the Cluedo televsion series, but not America. In an episode of the Australian show Neighbours, Brad and Beth show their feelings for each other over a game of Cluedo. If you look very carefully in the toy store battle scene near the end of Gremlins you can see the 1972 edition of Clue on a shelf. In several episodes of the hilarious Seinfeld, the 1992 Clue can be seen amongst the boardgames in Jerry's apartment. In the Red Dwarf episode, "Queeg" Holly the computer challenges Queeg to a game of Cluedo and graciously permits him to be Col.Mustard. In the film Bill and Ted's Bogus Journey, Clue is amongst the games the duo play with Death. Death loses when he fails to accuse the true killer, Miss Scarlet. 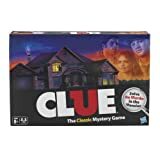 In the mid-nineties TV series Living Single, Queen Latifah's character, Kadijah's favorite board game is Clue. The official Clue(do) website hasn't been updated since November, 1998. On a "Tonight Show", host Jay Leno used the 1996 Clue in part of a gag. Anthony Pratt's original Cluedo prototype contained such weapons as the bomb and hypodermic sryinge! In one Sunday strip of the comic strip Robotman, Monty and Robotman play Clue. The 1980's Cluedo book, called Cluedo: Armchair Detective, lists names such as Rev Horatio Green, Mrs.Penelope Peacock, and Prof.Peter Plum. In the book, Plum and Peacock are siblings. Thanks to Chris H for this fun fact. In 1999, Clue(do) was inducted into Games Magazine's Hall Of Fame.